of the patient's problem and develop a plan that is specifically based on the patient's needs. Our Smoothbeam technology safely and effectively treats a wide variety of cosmetic skin problems that before now were difficult or impossible to treat. acne scars with the Smoothbeam laser with no downtime and minimal pain. Dermal Remodeling with Smoothbeam Laser helps to renew skin by stimulating the generation of new collagen formation of the skin. 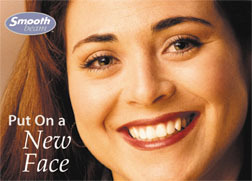 Smoothbeam's Laser Assisted Skin Renewal is an “inside out” approach to healthier looking skin. The patented LASR process represents advanced technology for remodeling the body’s natural collagen using no dangerous chemicals, needles, anesthesia, and requires no aftercare or down time - just healthier, better looking skin. Before now, collagen obtained from cows was used to plump up wrinkles, lip lines, crows’ feet, smile lines and acne scars. While this procedure provides excellent results, the body detects cow collagen as a foreign substance and eliminates it slowly within 3 to 6 months requiring you to repeat the process again and again. The expense involved in a lifetime of repeated treatments can be substantial. Smoothbeam's Laser Assisted Skin Renewal features a unique wavelength of laser light that selectively heats the upper layer of skin, causing a mild thermal injury. The body’s natural healing response begins to initiate its own collagen which remodels in the treated area. The entire procedure is performed quickly, safely, and has no patient down time because the treatment is non-invasive. You can now go about your daily activities without anyone knowing you had a skin renewal treatment. Smoothbeam Treatment renews skin while protecting it. An integral part of the LASR process incorporates the use of a (DCD) Dynamic Cooling Device. DCD protects the skin by automating the delivery of a cool, cryogen spray to protect the treated area of skin. As it cools, it protects the skin making our Smoothbeam treatment comfortable. Clear skin is right around the corner. Treat acne with Smoothbeam - the only laser clinically proven to target acne at the root cause. Acne is an inflammatory skin condition affecting the sebaceous follicles - follicles containing oil-producing sebaceous glands. Acne is most common on the face, neck, shoulders, upper back, and chest where there is a high concentration of sebaceous follicles. Symptoms of acne include blackheads, whiteheads, red spots, nodules, and cysts. Smoothbeam helps to renew skin by stimulating the generation of new collagen formation of the skin for a healthy, smooth appearance. A typical treatment will take between 10 and 30 minutes. Depending on the degree of aggressiveness together we decide on, your treatment can be a "lunchtime" procedure, in which you can go right back to work, or more aggressive treatment, in which there will be a brief recuperative period. Consult with us about your treatment schedule and interval between subsequent treatments. During the treatment, we will all wear safety glasses to protect our eyes during the procedure. We will use a small hand piece with a probe that touches your skin to deliver the laser light. You will feel the light spray of coolant onto your skin just before each laser pulse. Because the laser's Dynamic Cooling Device is so effective, many patients report the procedure as "mild," with little more than a slight snapping or tingling sensation. Although results vary, you should discuss your expectations with us. Several treatments may be required, depending on anatomical location and the extent of desired results. Avoid sun exposure for 4-6 weeks before treatment, and again after treatment until your physician allows it. Care should be taken in the first few days following treatments to avoid scrubbing or rinsing the treated area with abrasive skin cleansers. In general, most procedures have a low risk of side effects. More aggressive treatments might induce some temporary discoloration or reddening of the skin. Some patients might experience pigment changes in skin color. If this occurs, the skin will typically return to normal pigmentation over time. Most insurance companies do not offer reimbursement for cosmetic procedures; however, you should consult your insurance provider for specific information. ProLase Laser & Skin Clinic specializes in advanced Laser Treatments using only the best LASERS on the market today. Other spas use IPL, find out why LASER is the best choice for hair removal, scarring, hyperpigmentation and more.